I’m a total kid at heart when it comes to these crispy, gooey treats. Mom made them when we were growing up, and I still can’t resist them. A batch does not last long at our house, so it’s probably a good thing that I don’t make them very often. There are many, many ways to fix these rice crispy treats, but I like the simple version—no nuts, no peanut butter, no brown rice. Well, actually there is one thing that I like on top of my treats…Nutella. Spread a layer of that heavenly hazelnut chocolate concoction on top, and all self-control goes out the window. It makes a tasty treat that is good for your soul, if not your hips! 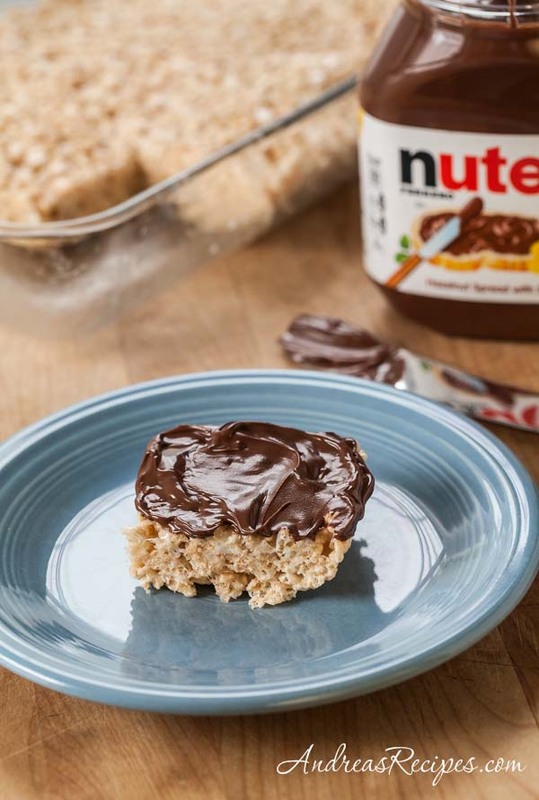 For more great ways to use Nutella, visit the the recipe archive at NutellaDay.com. In the pot, melt butter oven medium heat. Add the marshmallows and melt, stirring constantly. Remove from heat and stir in the vanilla and sea salt. Stir in the crispy rice cereal until completely coated. Pour the mixture into the buttered baking dish. Wet your hands and press the mixture down firmly. Allow to cool, then cut in squares and serve with Nutella spread on top. Oh my! I haven’t had Rice Crispy treats in years. As a kid, it was one of the few things I could make. I’ll have to revisit this classic, and I love how you spread Nutella on top. Brilliant!